Pachai Mor Kulambu or Raw buttermilk Kulambu is of the regular dish in my mom’s house. After coming to Singapore I totally forgot this dish. I prepared this dish last week and it became a hit in my house. It is a very easy dish which can be done in few minutes if we have the powder ready. This dish does not need any coconut which makes it easier for me to cook as we get only the prepacked coconut nearby my place and I like to use the fresh ones always. 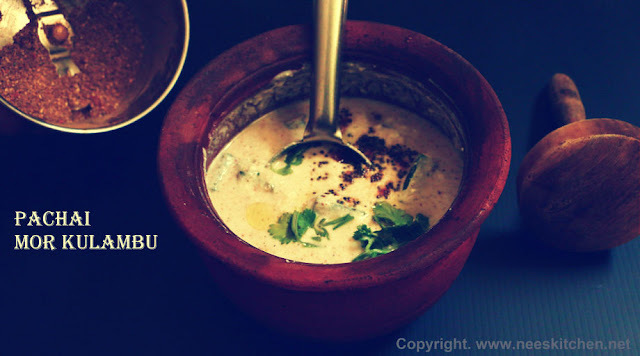 This dish can be mixed with rice like a regular mor kulambu or it also goes well like a raita. 1. Dry roast the ingredients in “For the powder” table without any oil. 2. Let it cool. Grind it to a nice powder. 3. Fry or boil the vegetables. Potato or yam needs to be boiled. Ladies finger should be fried. You may add any other vegetables of your choice and cook it. Add salt for the vegetable. 4. Beat the yogurt without water. 5. Add the powder, salt and the vegetables and mix them. 6. If the yogurt is still thick then add water, else it is not needed. Pachai mor Kulambu is ready to be served with hot rice. Yogurt should not be sour. Make sure the dish doesn’t become too watery , else if would be difficult to mix it with rice.